Speaking at the launching of a new training program for bank tellers and customer service representatives, city Councilman Derek S. Green said he got his professional start as a bank teller. Given the way the phrase rolled off his lips Thursday, the old Meridian Bank slogan was obviously hardwired into former Meridian bank teller turned Philadelphia city councilman Derek S. Green's brain: "Professional with the personal touch." Green wasn't the lead speaker at Thursday's event launching a new training program for banks at the Philadelphia Opportunities Industrialization Center Inc (OIC), but he gave powerful testimony about how a young person growing up in an urban neighborhood can get a leg up into the professional world with a start as a bank teller. Maybe, he said, a teller could become a politician. "I still count my money a certain way," he said, laughing. 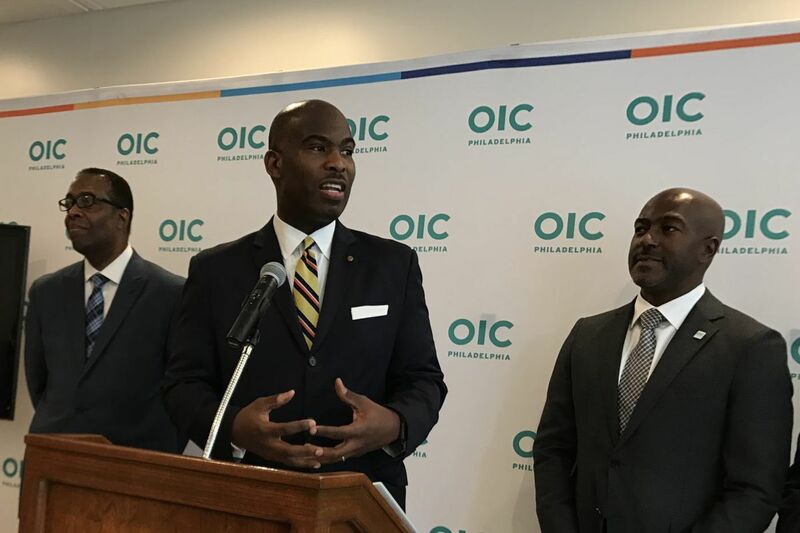 As an OIC board member, Green was part of a lineup with officials who met Thursday to announce the BankWork$ program, a California-based initiative making its Philadelphia debut. The Philadelphia program, funded by the Sheri and Les Biller Family Foundation and Wells Fargo Bank, provides eight weeks of free training aimed at people 18 to 24 who want to start a career in banking. Students receive lessons in customer service skills, bank regulations, banking products, and job-search techniques. OIC, led by Kevin R. Johnson, will host the classes, which will begin in September. Enrollment information will be available on the OIC website. Former Wells Fargo Bank executive Les Biller and his wife started BankWork$ in 2006 as a project for their family foundation. The program began in Los Angeles and has been expanded to Seattle, Chicago, Denver, Houston, and other cities. As part of a $4 million expansion program with Bank of America, U.S. Bank, and Wells Fargo, BankWork$ will set up operations in Philadelphia, Atlanta, St. Louis, and Dallas in 2017, adding more cities by 2019. In other cities, Wells Fargo has hired 50 percent of the program's graduates. Typically, officials said, 75 percent of each class of 24 people graduate and of those, 71 percent are hired into banks as tellers, customer service representatives, and personal bankers. Even in this day of online banking and ATMs, banks still need human beings, said Stephen D. Briggs, vice president and senior community development officer for Wells Fargo in Philadelphia. Biller said banks try to hire people who match the communities where their branches are located, but find it difficult to find qualified people in low-income communities. Even though the job market is improving overall, unemployment remains high in cities. That's why BankWork$ hasn't "had a problem recruiting or placing people," he said. He said BankWork$ tracks participants for a year postgraduation with more than 70 percent of the people hired by the larger banks still working at the same bank a year later. Biller said that's higher than the industry average. Teller pay has traditionally been low, but is now increasing. Wells Fargo tellers now earn $13 an hour. Minimum wage in Pennsylvania is $7.25. OIC board chairman Atif Bostic said he hopes the program will bring more diversity into banking. Bostic, who heads the Uplift Foundation and grew up near OIC's offices in North Philadelphia, also worked as a bank teller, later earning promotions at Wells Fargo and Citizens Bank. He said that as he advanced in banking, diversity decreased.